Home › Culture › Peel – a Hot Spot for Family fun this Summer! Peel – a Hot Spot for Family fun this Summer! With summer in full swing, one of the hot spots for family fun and entertainment is going to be Peel, including the town’s annual carnival, a new exhibition commemorating internment and the perennial traditional boat weekend. The exotic Viva Brasil dancers, providing a flavour of Ri o de Janeiro, will be making a welcome return to Peel Carnival after their very successful Island debut in 2016, joined this year by the Manchester based band Panfire, street performers Splat (who will also be holding a circus skills workshop) and members of the Norwich based Louise Hamilton Trust with their life-sized knitted garden in a marquee on the beach. There’s also over £1,000 to be won in competitions – including a new fancy dress class for dogs! 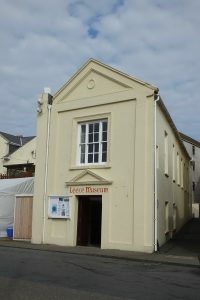 History buffs can also step into the Leece Museum, where there will be a free exhibition of photographs and memorabilia, about the Peveril Internment Camp, which was based at the northern end of the town during World War II. It became known as the fascist camp and was immortalised by daring escape efforts, (including a well planned tunnel on Peveril Road) and a riot within the camp itself after an aborted sea escape by three fellow internees. 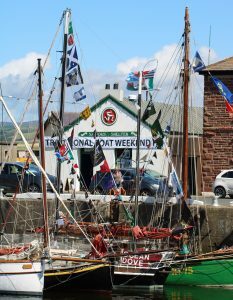 But for those who like messing about in boats, the Peel Traditional Boat Weekend is a popular event in the west, where they can enjoy local hospitality. There’s a boat building competition and race down by the harbour with cash prizes available, Parade of Sail, and an art exhibition and sale of merchandise in the local Sailors’ Shelter on East Quay this weekend.